As the NYPD slows arrests for turnstile jumping, New York City’s neighborhoods of color remain a target. For New York City police, turnstile jumping has long been much more than a class A misdemeanor. The strict policing of people evading the fare on public transit was justified as an all-purpose solution to the rampant crime that plagued the city’s subways in the 1980s. It became one of the first examples for the New York Police Department that cracking down on minor offenses—the controversial “broken windows” theory of policing—might restore order to the city. This story was produced in partnership with Gothamist. But New York might be changing its mind about turnstile jumping. With broken windows strategies increasingly discredited by many criminologists, a more lenient approach to this minor offense has taken root in New York’s courts, and perhaps from there found its way onto subway platforms across the city. Last year, Manhattan District Attorney Cyrus Vance Jr. announced that his office would stop prosecuting most cases of fare evasion, which includes riding public transit without paying the fare through any number of means: jumping over or under a subway turnstile, boarding a bus through the back door or failing to pay for a cab. Public defenders across the city observe that the vast majority of fare evasion cases come from the subways. Since Vance’s announcement, such arrests dropped from a high of 25,000 in 2016 and are now on track to be fewer than 10,000 this year. The NYPD has said that the majority of turnstile jumpers are issued civil summonses, not arrested. Some city leaders wonder though—should turnstile jumping be a crime at all? A Marshall Project analysis of New York Division of Criminal Justice Services data from 2014 through June of this year shows that while the numbers of turnstile arrests have decreased significantly, what has not changed is who gets arrested: 89 percent of those arrested this year are black or Hispanic, virtually the same proportion since 2014. Across the city, neighborhoods with the most turnstile arrests per subway card swipe tend to be predominantly black or Hispanic. In September of 1979, the New York City subway was the most dangerous mass transit system in the world. If the 250 felonies that took place in its tunnels every week didn’t scare off potential passengers, then the service cuts, power outages, maintenance backlogs or 2,500 yearly car fires did. With ridership at near-historic lows, some predicted there would be no riders left by 2002. At the same time, the issue has put Mayor Bill de Blasio at loggerheads with Vance, with the mayor siding with the NYPD and MTA leadership, maintaining that fare evasion policing is a necessary tool for bringing safety and order to the subways. So far, none of the rest of New York City’s district attorneys have followed Vance’s policy. Former Police Commissioner William Bratton, who implemented broken windows practices in New York during his term in the 1990s and was appointed as commissioner again by de Blasio in 2014, credits the city’s crime drops to those strategies that target minor crimes. "When I was chief of police, we began to focus on fare evasion," Bratton said in 2014. "And what did we find? One out of every seven people were wanted on a warrant. One out of every 21 were carrying weapons, from box cutters up to Uzi submachine guns. So the New York miracle, if you will, began with fare evasion enforcement on the subway 25 years ago." De Blasio also disagrees with advocates that poverty is the main reason people hop the subway turnstiles. When questioned on the Brian Lehrer show in February, de Blasio stated that there is “no evidence” fare evasion is a crime of poverty. His statement runs contrary to the MTA’s own research, which links increasing rates of fare evasion with low-income neighborhoods. According to the study, areas with high passenger traffic and areas of low income are the best indicators of where turnstile jumping happens most. 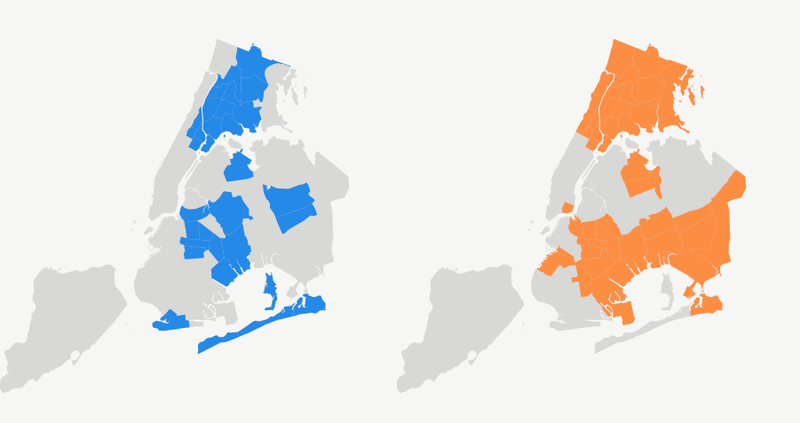 The Marshall Project’s analysis found that turnstile arrests do not match strongly to the police precincts with the most subway users; the five busiest precincts are in predominantly white neighborhoods. Neither does poverty explain the racial disparities in arrests. According to the Mayor’s Office of Operations’ 2017 poverty report, blacks and Hispanics make up just over half of the poor population of New York, despite representing nine out of 10 of those arrested for turnstile jumping. Take the 14th precinct, the bustling Midtown neighborhood that is home to Times Square, Penn Station and the most subway usage in the entire city. The data shows the highest number of fare evasion arrests occurred here. But when subway traffic is taken into account, the rate of arrests per Metrocard swipe in the 14th precinct drops to below the average for the city. Farther uptown is New York’s 40th precinct, an area of the South Bronx across the Harlem River from Manhattan. This precinct had half as many turnstile arrests as the 14th, but it still had the second most arrests in the city. With less than one-tenth the traffic, it had one of the highest arrest rates per swipe in the city. Almost every one of the local residents in that precinct is black or Hispanic, and the average per capita income is $13,000 per year. When adjusted for subway traffic, the top 10 neighborhoods in New York with the highest numbers of arrests per subway swipe were all predominantly black or Hispanic. The findings are consistent with existing research, like a recent study of fare evasion cases in Brooklyn finding poor black neighborhoods have disproportionately high rates of turnstile arrests per swipe, even when poverty and crime rates are accounted for. The study, which was carried out by a nonprofit poverty advocacy group, the Community Service Society, found that while black men aged 16–36 represented 13.1 percent of poor adults in the city in 2016, they made up half of those arrested for fare evasion. Beyond the MTA’s public release connecting turnstile jumping to poverty, little is known about the demographics of those who evade the fare, or where it happens the most. The MTA has not released its internal data on fare evasion. Data tracking the race of those who receive summonses rather than being arrested has also not been released by either the MTA or the NYPD. And information about arrestees’ criminal history, which department policy names as one of the factors used to determine whether someone is arrested or issued a civil summons, has also not been made available by the NYPD. A lack of data about turnstile policing, especially its effects on communities of color, is one of the reasons Lancman sponsored a bill last year requiring the police department to release detailed breakdowns of both fare evasion summonses and arrests by race, age and gender for every subway station in the city. The bill passed in December, but the police department has so far failed to meet three quarterly deadlines to release the data. A growing list of advocates and political leaders seem inclined to agree, with calls for decriminalization of fare evasion coming from numerous directions, including State Senator Jesse Hamilton and Assembly member Tremaine Wright. The two Brooklyn Democrats introduced a bill last July that would make fare evasion a civil offense, the outcome of which would be a potential fine or community service rather than arrest, incarceration or a criminal record. Advocates and community organizers from Why Accountability and the Coalition to End Broken Windows, groups that support decriminalizing fare evasion, began a campaign in 2016 to encourage New Yorkers to swipe people in when exiting the subway. Kei Williams, a lead organizer with Swipe It Forward, believes that by swiping someone through, you can potentially save someone from entering the criminal justice system. And this summer, de Blasio and the New York City Council agreed to include $106 million in the city budget for Fair Fares, a program to provide half-price transit rides for about 800,000 New Yorkers living in poverty.